This ammunition for TT-33s and other 7.62 Tokarev pistols is manufactured in Romania and imported by Century Arms International (CAI). Packaged in boxes of 50, these new-production cartridges use non-corrosive Berdan primers and non-reloadable steel cases. 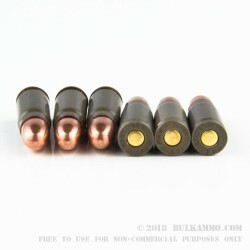 Each round fires an 86 grain bimetal jacketed bullet. 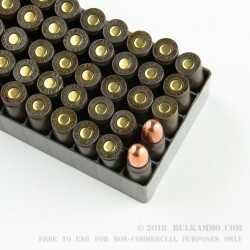 Due to its steel components (and resulting magnetic properties), this ammo may not be suitable for all indoor ranges. Check with your range before ordering if you plan to shoot indoors. Century Arms International is one of the main US-based importers of former Eastern Bloc weapons, as well as firearms from other countries around the world such as Turkey. They also import ammunition such as this "Red Army Standard" series, which is available in a variety of common ex-Soviet cartridges.